Messier 91 (M91) is a barred spiral galaxy located in the Virgo Cluster, in the constellation Coma Berenices. The galaxy has an apparent magnitude of 11 and lies at an approximate distance of 63 million light years from Earth. Its designation in the New General Catalogue is NGC 4548. Messier 91 occupies an area of 5.4 by 4.3 arc minutes of apparent sky, which corresponds to a linear diameter of 100,000 light years. It is the faintest of all Messier objects and one of the most difficult to observe. Small telescopes at medium power can reveal hints of the bar structure under exceptionally good conditions, but the bar is better seen in photographs than visually. In 6-inch and 8-inch telescopes, the galaxy appears as a faint patch of light with a brighter centre. Larger instruments show the bright bar region and, depending on the conditions, the galaxy’s spiral arms. 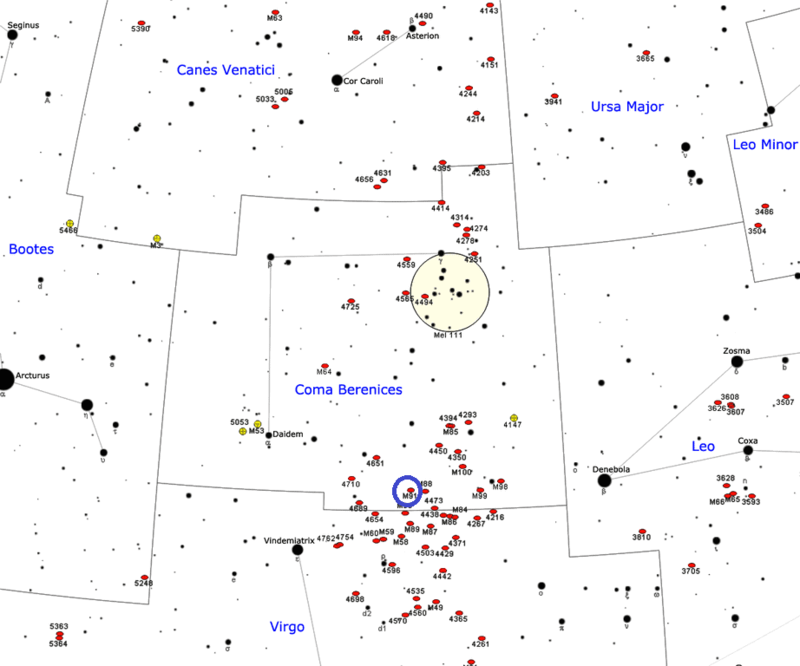 Messier 91 can be found about a degree north of the border between Coma Berenices and Virgo and north of the line connecting the bright star Denebola in Leo constellation and Vindemiatrix in Virgo. The slightly brighter elliptical galaxy M89, which lies about 60 percent of the way from Denebola to Vindemiatrix, is located 2 degrees south of M91. 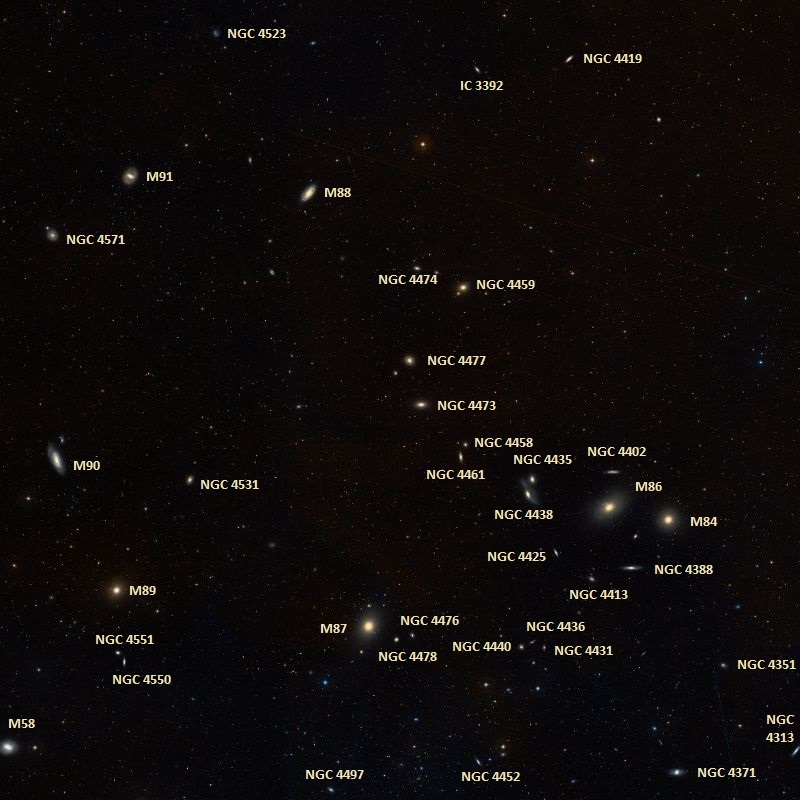 The best time of year to observe M91 and other galaxies in the Virgo Cluster is during the spring. Messier 91 has a very prominent central bar, oriented at an angle of 65/245 degrees. The galaxy is receding from us at 486 km/s. 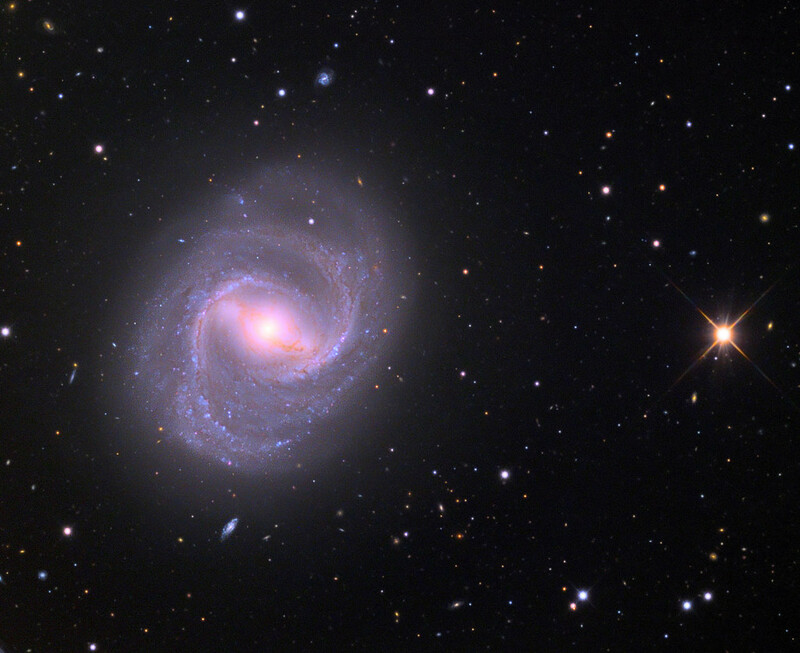 Messier 91 is classified as an anemic galaxy, which is to say, it is a spiral galaxy with very little gas and a low rate of star formation compared to similar galaxies. M91 is home to about 400 billion stars. 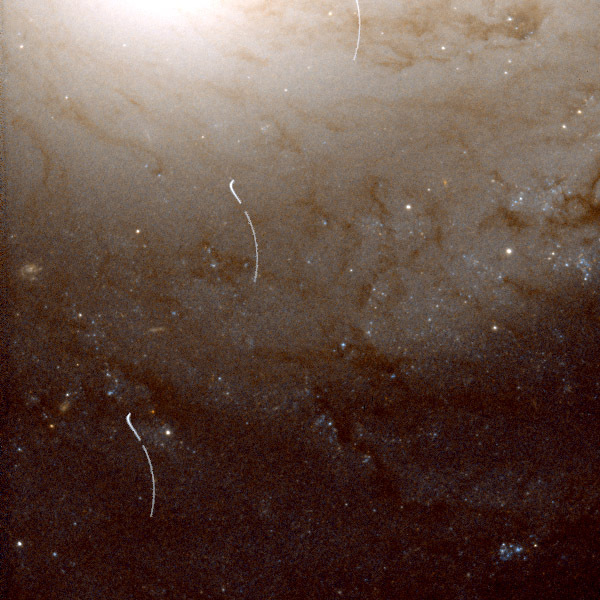 The galaxy’s membership in the Virgo Cluster was confirmed after its distance was measured at 52 million light years by the Hubble Space Telescope H0 Key Project Team in 1997. The team used Cepheid variables to determine the distance to the galaxy and found that it is similar to the distances of other cluster members. The galaxy’s membership was questioned for a long time, mainly because it is anemic, has relatively low surface brightness, and is moving away from us more slowly than most cluster members. The average recession velocity of the Virgo Cluster galaxies is 1,100 km/s. The galaxy’s lack of gas is explained by the ram-pressure stripping that it is experiencing as it moves through the heavily populated cluster. The process has left M91 and other cluster members stripped of gas. The constellation of Virgo, & especially the northern Wing is one of the constellations which encloses the most Nebulae: this Catalogue contains thirteen which have been determined: viz. Nos. 49, 58, 59, 60, 61, 84, 85, 86, 87, 88, 89, 90, & 91. All these nebulae appear to be without stars: one can see them only in a very good sky, & near their meridian passage. Most of these nebulae have been pointed to me by M. Méchain. Messier 91 was a missing Messier object for a long time as a result of a mistake made by Messier, who had logged the object’s position from Messier 58 instead of Messier 89. The 91st entry in the Messier Catalogue was believed to be either a passing comet or a duplicate observation of M58. William Herschel observed the object on April 8, 1784 and catalogued it as H II.120, describing it as large and round. A bright * 9m, and 2 or 3 smaller; close by the B star and sp it, is a small well defined body which may be a close double star, and np is also a F neb. The place set down is that of Messier’s 91st neb, but I do not think this can be that object, whose existence even seems questionable. A bright star of 9th magnitude, and 2 or 3 smaller; close by the bright star and south preceding [SW] of it, is a small well defined body which may be a close double star, and north preceding [NW] is also a faint nebula. The place set down is that of Messier’s 91st nebula, but I do not think this can be that object, whose existence even seems questionable. In 1969, amateur astronomer William C. Williams identified NGC 4548 as M91, which was noted by William Herschel in 1784. For a time, Herschel considered the barred spiral galaxy NGC 4571 (his H III.602) as a candidate for M91. 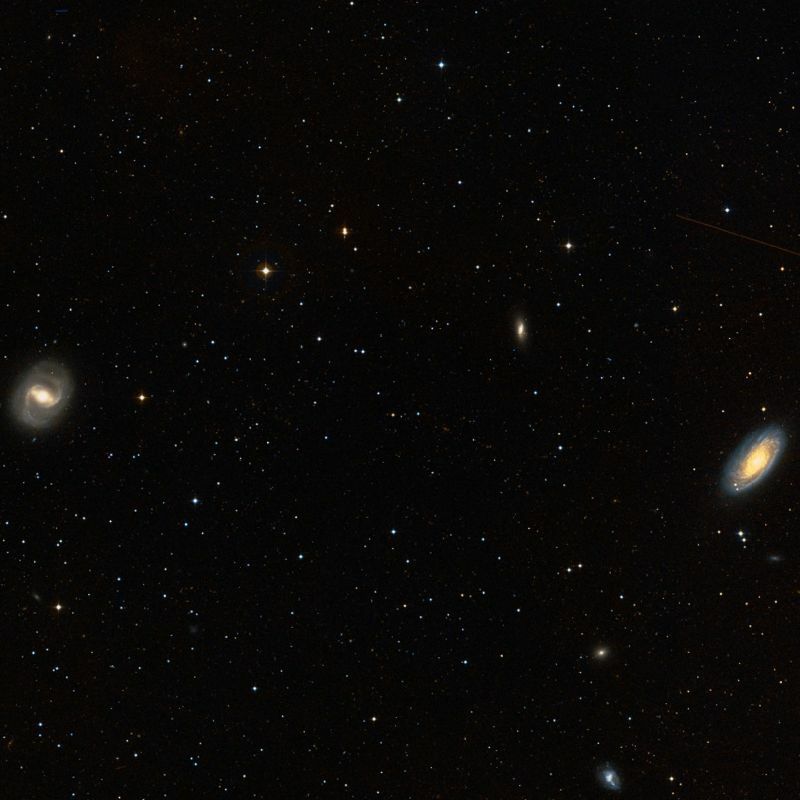 Williams measured the right ascension and coordination of NGC 4548 relative to M89, applied the differences of M91 with M58, and got the Messier position to 0.1′ in right ascension and 1′ in declination. 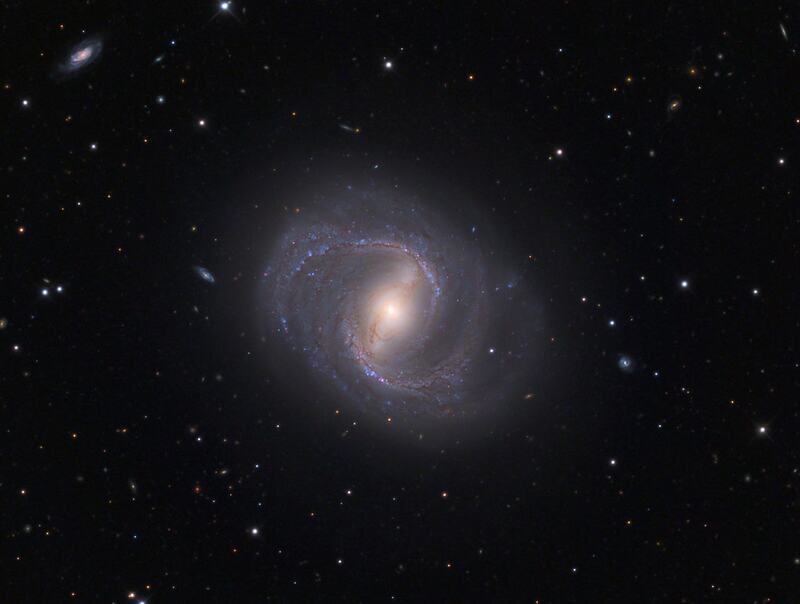 It can be simply demonstrated that the lost Messier object M91 is very probably the galaxy NGC 4548, at right ascension 12h 32m.9, declination +14d 46′ (1950 coordinates). As Owen Gingerich pointed out in his article “The Missing Messier Objects” (Sky and Telescope, October, 1960, page 196), M91 was the last of a group of eight nebulae observed by Charles Messier on the night of March 18, 1781. The French astronomer described it as a “nebula without stars” and fainter than M90. He gave its position as 12h 26m 28s, +14d 57′ 06″; precessed to 1950, this is 12h 35m.0, +14d 02′. In what follows, 1950 coordinates are used. It reproduces the Messier position to 0m.1 in right ascension and 1′ in declination. The Skalnate Pleso Atlas Catalogue gives the visual magnitudes of NGC 4548 and M90 as 10.8 and 10.0, respectively. This checks with Messier’s statement that M91 was the fainter of the two. The same source gives the size of NGC 4548 as 3.7 by 3.2 minutes of arc.